A Literary Odyssey: Book 39: A Different Kind of Heroine. I really must read this one. I'm ashamed to admit I've never read an Austen. I love the films but have yet to really sit down and commit to a story. 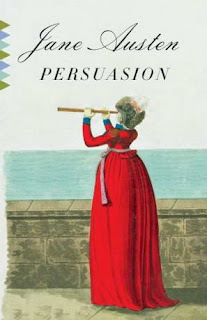 I love Persuasion precisely for the reason that it was a beautifully written, mature love story which was as passionate as it was well-written. I always get the feeling that although P&P is still my favorite, as of my next re-read Persuasion will overtake it. I completely agree with you about the different, mature tone - it is also a mature love. Have you had the chance to read any of the unfinished novels (The Watsons, Sandition)? It's clear that her writing was changing and heading into a much more realistic style. I've read all of Austen and love each of the books for very different reasons, but I can't help it, Persuasion is my favorite. There's something wonderful about the fact that it isn't about the early stages of infatuation. The characters are older, more mature and they've had a chance to think about what they really want in life. Where as some of the other books almost seem like they fall in love, because that's the person that's closet to them at that moment. And a love that can survive that many years of separation is impressive. Enjoy the rest! I haven't read it, but I'm looking forward doing it! I just love Persuasion. I must read it again!! Persuasion is my favourite Austen, exactly because of the reasons you mentioned and because of something you still have to come across. I'm glad to hear you're enjoying it.